Q: It’s Tuesday…do I know where my kids are? A: Yup! Roman is recovering from a stomach bug (which means I now have a very clean bathroom! ), and Jordi is reading the fourth book of the Wereworld Series! Q: What books are on my ping-pong table? 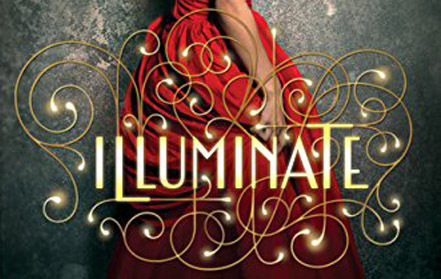 A: Illuminate by Aimee Agresti. BOOK REVIEW! I like it! Looking for a birthday or holiday gift for your teen or tween daughter, niece, or grandchild? Illuminate is the first in a series (always a plus) and Haven is a kind, unique, and relatively empowered female protagonist thrown into a world full of choices. Based in the real world, with supernatural good and evil characters, Aimee Agresti throws all sorts of temptations at her young protagonist, offering her readers an exciting ride down the path of choosing right over wrong & self-discovery. This morning, as I plucked stevia leaves in my kitchen, it occurred to me that there are several different worlds of fiction on our planet. The first is obvious, right? Fictional stories written and published for entertainment. Everything from the Blaire Witch Projects to Breaking Dawn to Cinderella is quite blatant about being fictional. The second has to be the many forms of spirituality, religion, and myth. Joseph Campbell can trump anything I could say on the subject, but…as most proclaim themselves to be the only correct version of events…clearly, all the rest must be fiction, right? And the third would be, the media and government propaganda. Reassuring stories are constantly being given to the public on all sorts of subjects! Small town paper, big city paper, national news station, or on the international stage…sugar-coated stories stand in for “the truth,” all over the world. Especially those realities that (if not sugar-coated) might create a public outcry. Whether governments, and their corporate handlers, want to control our fear or our outrage or our goals or our imagination or our votes…our world is full of “misleading fictions” where the authors are well-funded and not so honest. And that’s where many of our problems lie. In our ability, willingness – even eagerness – to find a story that feels good or satisfies our expectations…and believe it. This ability to “suspect disbelief” allows us to enjoy movies and wish that a character in a novel was our best friend! But, it also makes us vulnerable to those who are willing to lie to us. I recently had someone tell me that fictional story-telling was not nearly as important as real world reporting and non-fiction books, because fiction isn’t real. Knowing that this person tends to believe a lot of what is offered by various mainstream media outlets, I politely didn’t sigh too loudly. After all, what to believe is his choice, right? But, frankly, believing what’s offered up by “the news” and non-fiction books is the equivalent of reading Harry Potter and then trying to get your child enrolled at Hogwarts! If you’ve ever known a lot about a subject and then seen mainstream media coverage of the subject…you know what I’m saying. About 90% of that article is likely to be either wrong or grossly overly simplified, and there will be a clear bias to the story. The same can be said of many non-fiction books that load the shelves, especially during election years, full of diatribes, skewed statistics, character assassination, and other mental manipulations. Whenever someone writes about a polarized issues, the question becomes: Who paid to publish this book? In other words…follow the money. Newspapers (past & present), then radio, then television, and now the world of cyber-news weren’t invented, developed, and turned into successful business models by people who wanted to offer “fair and balanced” reporting. I mean, seriously! Who, with an opinion, will work for the opposite viewpoint? Look at the “knock down, drag out” fighting going on in public media everywhere around vaccines. My articles (with co-author Karen Crisalli Winter) about Community Health published in The Loop on Vashon Island are written, specifically, to represent what may be the ONLY middle ground voice on the issue. Meanwhile, I watch the mainstream media and government propaganda machine pushing for increased polarization, to the point where parents are being encouraged to judge fellow parents and their personal medical decisions; potentially tearing communities to pieces! The FACTS that various vaccines have different strengths & weaknesses, the immune system is incredibly complicated, countries with socialized medicine vaccinate differently (and why? ), individuals have unique genetic proclivities & family history, and that there will be a different “best answer” for each person…is cumbersome and requires mental work. It’s not so easy to paste on the side of a city bus. And it’s balanced. So, how often will you see this message in mainstream government messaging and the media? Pretty much never. I no longer talk about “the news.” I talk about “the media.” And the goal of “the media” is to tell stories that will manipulate the public to think, believe, and behave in ways which benefit specific monied interests. Even scientific research, and the rags that publish their articles, reflect the biases of the whoever funded the work…either purposefully or simply because under-funded studies don’t get done. Long story short. Humans are storytellers. It’s in our nature. We create them and we enjoy them. So, if you want to weave a story, go ahead! Just don’t write a fiction and then try to pass it off as fact. It makes us honest fiction writers look bad.